The first thing you notice about Byron Bay is that everyone is really attractive. Not in the overly primped and preened Hollywood kinda sense, exactly. It’s more like everyone who lives in this beach-meets-rainforest locale wears big smiles, has a nice tan, and seems genuinely happy all of the time. It’s a refreshing vibe, and fittingly, the area’s local brewery follows suit. 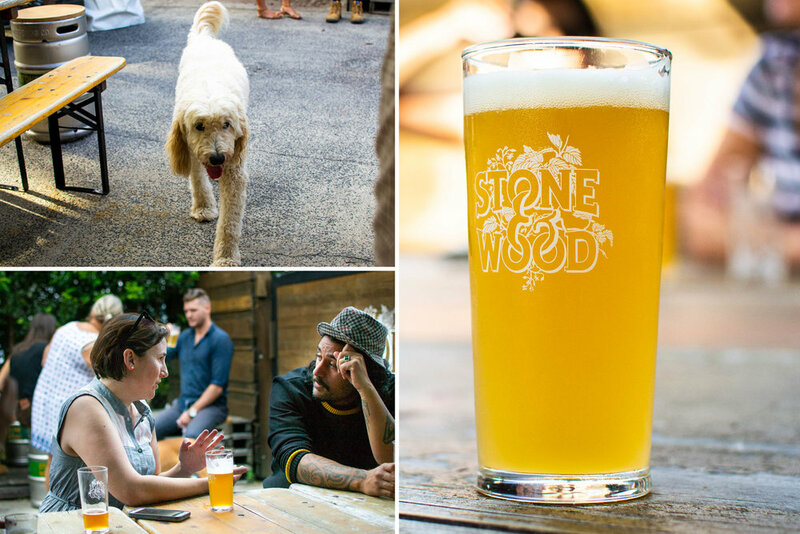 The people who work at Stone & Wood Brewing Co. are ridiculously jubilant human beings. No wonder I’ve been told that it only takes a few visits before you drink the Stone & Wood Kool-Aid. There are a hundred stories in Stone & Wood, but only one beer that binds them all: Pacific Ale. While words like “haze” and “juice” are how we describe seemingly every new beer in 2018, in 2009, when Pacific Ale launched (known as Draught Ale at the time, and initially intended to be keg-only), haze and juice were one of the last things Australian drinkers wanted in their beer. 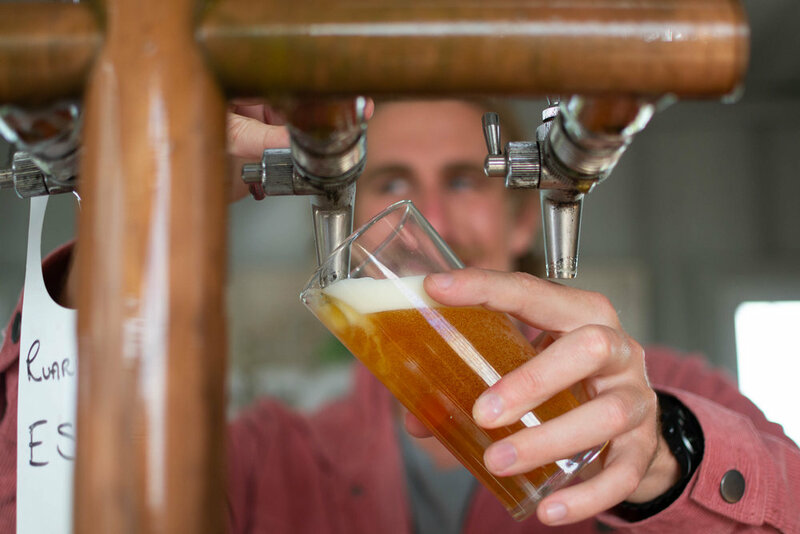 The 4.4% Pale Ale was in a class of its own back then, and it still is now despite the legal battle around the term “Pacific Ale.” It’s a silver medal winner at the World Beer Cup and regularly tops public and critic polls as Australia’s best beer. It’s become an archetype for Australian Pale Ales: light, easy-drinking, dripping with Galaxy hops that are all about the passionfruit and mango aromas. For years, it was pretty much the only beer the brewery made in its 25hl (15-BBL) brewhouse. 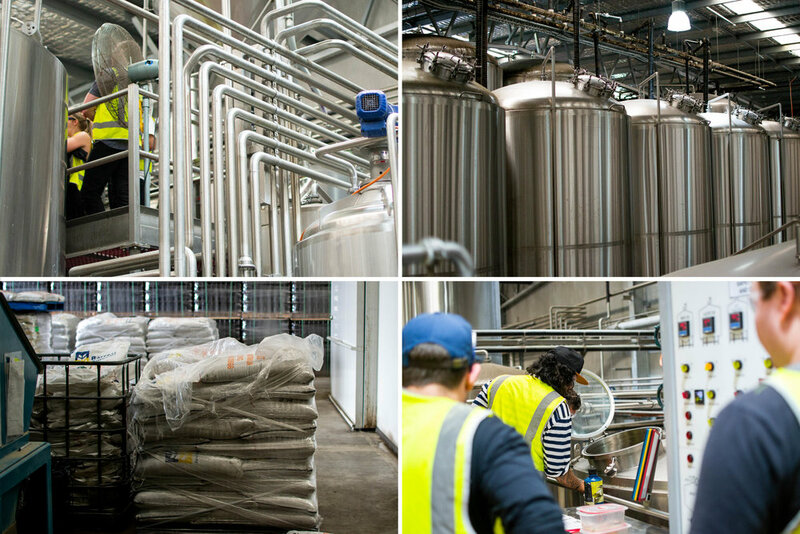 But in 2014, Stone & Wood opened a second production facility which now has two 50hl (30-BBL) systems running side by side, 16 hours a day, 7 days a week, 363 days a year. (They knock off for Christmas and one day for staff training). While Pacific still dominates production, a few more beers from the crew are eking their way into the rotation, including an unabashedly amped up version of Pacific Ale known as The Prequel. That one’s very much a modern Hazy IPA retrofit based off the homebrew recipe cofounder Brad Rogers was making before it became Pacific. Rogers started the brewery in 2008 with Ross Jursich and Jamie Cook. 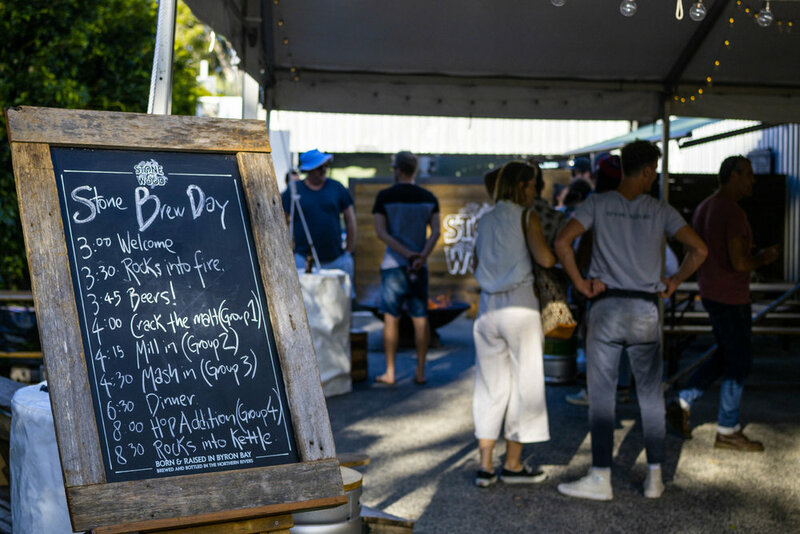 The trio came from a Megabrew background, all working in various senior roles for Carlton United Breweries (AB InBev) around the various state capitals before cashing in and moving to sunny Byron Bay. It was there they created a fiercely independent, community-driven, environmentally passionate brewery. It’s a certified B Corporation, and this year announced 72% of its 100+ employees are part owners of the business through an employee share program. 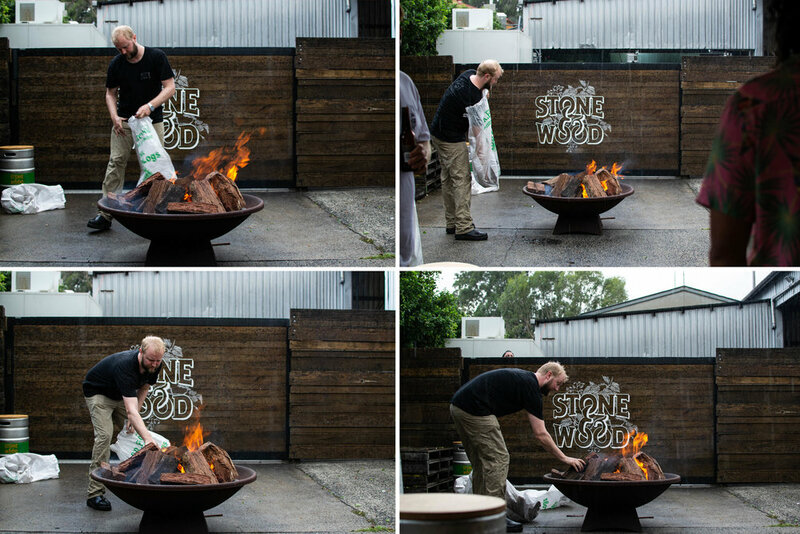 Each year a small group of bar and bottle shop owners, suppliers, locals, and media are invited along to its annual Stone Brew Day. The event is named for the brewery’s Stone Beer, which is brewed in the tradition of German Steinbier, but more on that in a minute. Half a dozen Melbourne visitors arrive at Gold Coast Airport to be greeted by Pat Coulson, one of the brewery’s sales guys. His long hair is tied back, he’s got a big grin tucked underneath his moustache, and he apologizes as we climb into the van—he needs to make a slight detour to pick up his surfboard. Being a coastal brewery, surfing is very much part of the lifestyle. Later in the weekend, Coulson tells us he lives not far from founder Jursich and it’s not unheard of for them to hit the surf together around client meetings. He’ll wedge the board into the back before we start the hour long drive to Byron Bay. On the way, we pass the site of their future brewery bar and offices. The $3 million project will make Stone & Wood the first thing you see when you drive into town. For now, we head through quiet streets to its current brewery and tasting room. Matt Damon was in earlier, but the brewery’s closing up for a private event, so he wasn’t able to stick around. Sorry, Mr. Damon. Beer in our hands, the sun blankets everything. A couple dogs wander about looking for scratches. We can’t sit around all night just drinking at a brewery, though—that’s a job for tomorrow night. We pile back into the van to check in at our accomodation before drinks and dinner. Our hotel is located in a campground that’s a literal stone’s throw from the beach. Awaiting us in our cabin is a goodie bag of local chocolate and snack bars. 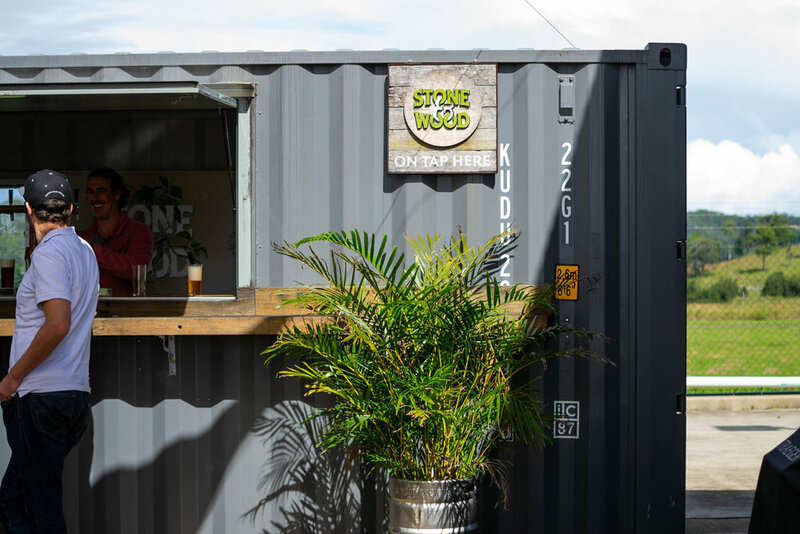 We find a dozen cold Pacific Ales in the fridge and, as we sit killing time in the warm evening air, I take the chance to ask my roomie and fellow beer writer Will Ziebell his thoughts on Stone & Wood’s place in the Australian beer landscape. It’s also a brewery that has regular rumors of them being sold, or wanting to sell, or even being already owned by a larger brewery, despite their repeated insistence of independence. The Railway Friendly Hotel, known to locals as Rails, is a spot famous for its live music. Allegedly, they’ve had live music seven days a week for more than 30 years. It has plenty of good beer on tap, screens with sports, and a large, covered beer garden. The band is kicking off when we arrive, the first notes of “Stairway to Heaven” trickling out. Brave group, we think, before the quartet spends a thrilling seven minutes assuring us they know exactly what they’re doing. After a few drinks, it’s a banquet dinner at the Balcony Bar & Oyster Co. Fittingly, we dine on the balcony while a tropical storm rolls in, sending everyone on the busy streets below running for shelter. Dinner is immense, all roast meats, fresh fish, and stunning salads. The Stone & Wood posse guide us through, and then on to the next pub. My memory quickly becomes unreliable. Breakfast is coffee, croissants, and fruit juice shared on a picnic table, followed by a surfing lesson for any interested parties. The sun is shining and the day warm already, but I wear expensive contact lenses, and being overdue for an optometrist visit, I’m only wearing one functioning lens. (No, I can’t wear glasses. No, I can’t see how many fingers you’re holding up. Yes, it’s terrible.) I skip the surf and go for a run along the beach, removing any risk of losing my lone lens amidst the waves. We’ve done a lot by lunchtime, and so I guess that’s why it’s time for liquor. 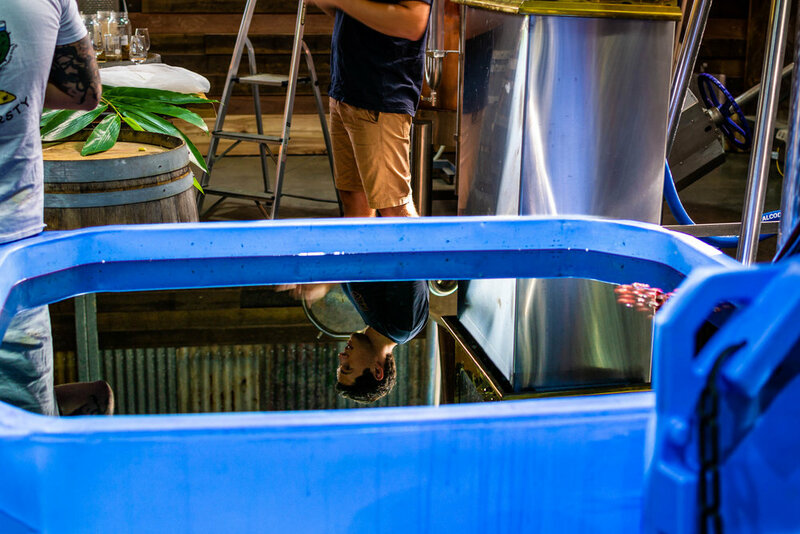 Fortunately for us, we’re standing inside Cape Byron Distillery, which makes Brookies Gin. 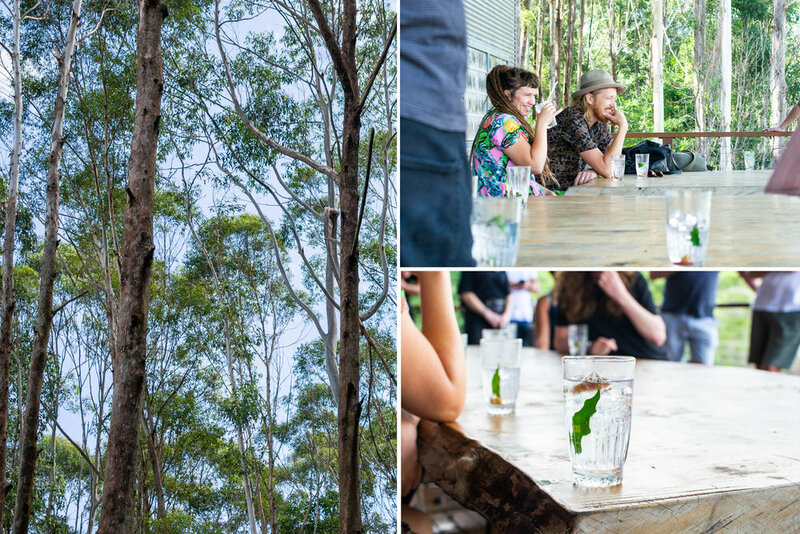 Gin and tonics with native aniseed-wattle leaves and finger limes are poured, and we hang out on the balcony while we hear its story. The distillery is owned by the Brook family, who bought the property in 1988 to grow macadamia trees. (As well as distilling, which is a more recent endeavour, they make a range of macadamia-based products.) At the time, the family also began clearing invasive trees and regenerating the surrounding rainforest. There’s only 1% of the ancient local forest—which is known as The Big Scrub—left, and we’re pretty much standing in the middle of it. We go for a walk to taste and smell native leaves and fruit, many of which are used in the gin. We learn about wild raspberries and Australian ginger, and stick our heads into a hive of native bees. They don’t sting, but rather, spit wax on their prey. Fortunately, we escape unwaxed. Then it’s back into the distillery to taste their “slow” gin made with native Davidson plums. The plums have a similar astringent acidity and flavor to sloe berries, hence the slightly bastardized name. Like many native botanicals, they were ignored for years, but are now finding favor in modern food and drink. After lunch at a local pub, the reason for our visit finally begins. 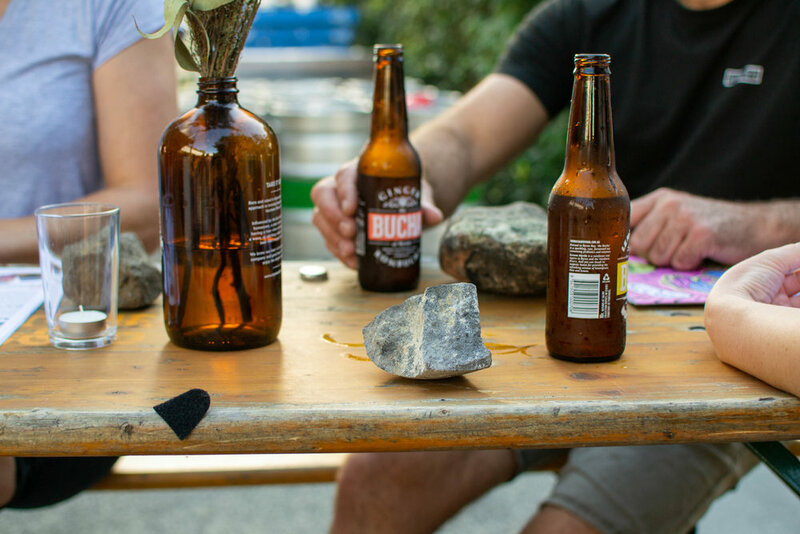 We arrive back at the Stone & Wood tasting room and are handed bottles of Kombucha, also made on site, and are asked to pick a rock from a big basket. We are given group numbers which correspond to parts of the brewing process, and head brewer Caolan Vaughan gathers us around the large cauldron to explain the beer. The rocks were bought back from Fiji by one of the founders, and each year they’re heated in a big fire and chucked into the beer. The reaction of red hot rocks is said to flash-caramelize the wort. Caolan says it’s a ritual they love because it pays homage to beer production methods pre-electricity. 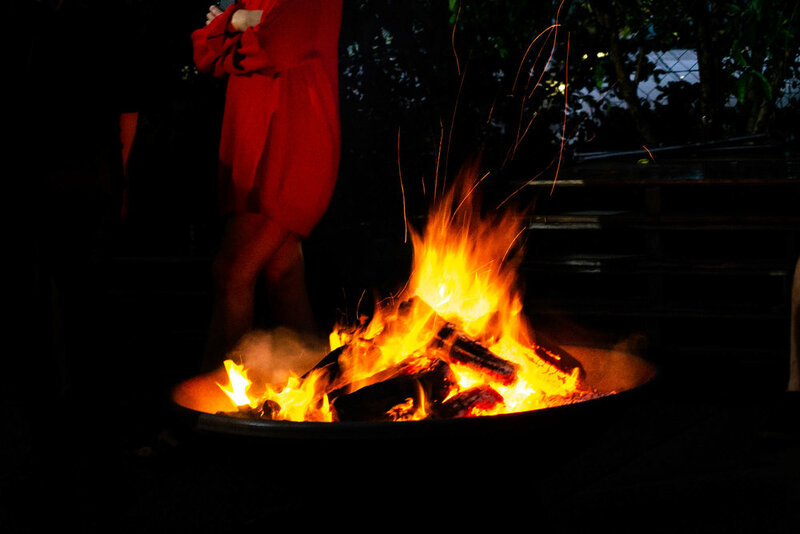 It’s also a great reason to gather friends together to stand around the shared focal point of a fire. We place our chosen rocks into the cauldron, and then, as the kids say, it's lit. An acoustic musician strums some Jack Johnson-esque tunes as we all settle in. Rain. Lots of it. This wasn’t on the itinerary, and Caolan is tasked with keeping things under control while we all run inside to stay dry. His efforts are appreciated. We make the most of a slight reprieve in the weather and stand around the fire, chatting and just generally enjoying life. Malt has been cracked, the mash is done, and the wort is boiling. My group task, a hop addition, is looming. Now would be a good time for my only functioning contact lens to fall out…onto the concrete...which is glistening wet...and of course it’s nighttime. A search party is formed, armed with LED phone torches. Is it in my drink? Stuck to my pants? On my camera? Smushed into the ground? After about 20 minutes, those and other questions are still unanswered. The beauty of Byron will be lost on me from here on out. But at least the drinks are good. The rocks are hot. Even I can see them glowing in the cauldron. I’m trying to work out what setting my camera is on and wonder if there is any chance of me getting a good photo of this unique event. (Ron Howard As Narrator: “There wasn’t.”) They’re removed from the cauldron, given a quick dunk in water to wash all the ash off, and placed into a basket. They’re then hoisted above the brew kit and lowered into the beer. Steam fills the brewery as the wort hisses and spits. People cheer. It’s a sudden transfer of energy and anticipation that brings the brewday to a close. Part of me feels like all of our standing, our conversations, and our good times were soaked up by the rocks and into the beer. Part of me wonders if my contact lens is in there, too. Plans are made to hit the town, but I suggest to my roomies that I’m better off grabbing a few bottles and heading home rather than blindly fighting Saturday night crowds. After a long day, they didn’t need much convincing, either. We drift back, a few Lagers in hand. We’ve had a hearty breakfast at a local café, and are now at the production brewery in Murwillumbah, a small town about halfway between Byron Bay and the Gold Coast. Beers are poured out of the container bar. We mill about in the sunshine, catching up on the previous night’s events, before taking a tour of the facility. It’s three years since my last visit, and since then, the brewery’s added a second kit and a lot more fermentation space. There’s more growth to be had, but this is a brewery determined to do it correctly. Only 10% of Stone & Wood’s sales go through national retailers, for example. That number could be much higher if they were willing to sell more to the big box stores, but they aren’t. It’s a brewery happy to do things at its own speed, on its own terms. The tour—and my weekend, as it turns out—culminates with a fresh bottle of Pacific Ale, right off the bottling line. It’s a fitting toast before we head to the airport, and some of the loveliest Kool-Aid I’ve ever tasted.